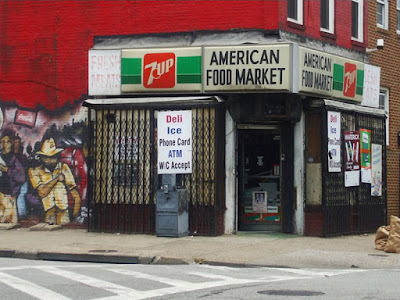 The Corner Store - blight or savior of urban neighborhoods? Most readers of the Baltimore Sun probably never shopped in a store where the clerk sits behind a scratched and yellowed bulletproof plexi-glass screen and transactions are handled via a slot under the glass or a turntable like in bank. Most probably never paid the prices that these stores charge for the hot dogs, snacks and other packaged goods they sell and which are usually higher than those for similar items in a Harris Teeter, Trader Joe's or Wegmans. 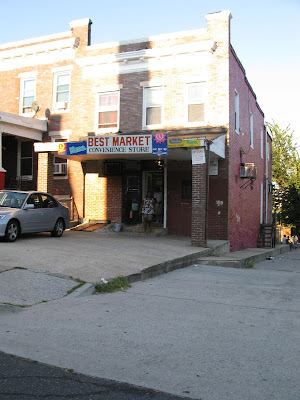 So for most the mayor's statements about Baltimore's corner stores falls neatly into the narrative of Baltimore's dark places where the better off never go. But then, most have never needed credit from a shop-owner when they needed food before the next check comes in and most wouldn't get such credit from their grocery store where they are not recognized, even though they have been shopping their for ages. But in a Baltimore neighborhood corner store, this is not unheard of. Some shop keepers occasionally extend credit to their loyal customers. Most don't think twice about loading their car with heavy shopping bags and wouldn't dream about carrying them home instead. They don't know what it means to shop groceries without owning a car and how helpful it is to be able to just walk down the block to get a can of soda, a six-pack or a cup or a package of sliced ham. For most the "corner store" is only an item of a distant past when Baltimore had streetcars, the sidewalks were thick with pedestrians walking to places and the City had nearly a million residents. 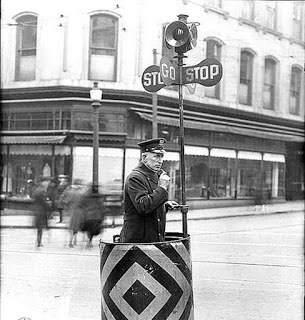 In those days almost every neighborhood intersection had a at least a couple of stores,covering almost any need, from butcher stores to bakers, and from cobblers to ethnic deli food. How these stores changed over time is a perfect mirror of the shifts in American urban landscape. With suburban flight, with the fixation on the automobile came the shopping center and the supermarket, combined pushing corner stores either out of existence or forcing them to shift to items suitable for a small store, small in size and high in profit. For example: cigarettes and liquor. Still, competing with the 24/7 supermarkets and the 7/11 convenience stores became almost impossible. Thus the corner store became the jumping board for immigrants who would commit to 16 hour workdays seven days a week. Ironically, these heroic attempts of making it in America just to escape the crushing conditions of the places from where they came, took place in neighborhoods that became more and more like places of last resort, resembling what the immigrants had fled: Crushing poverty, violence, bad schools and poor health. Thus the corner store has become the intersection where the ethnic, class and cultural conflicts of contemporary America are being carried out. Those stores already bore the brunt of the civil unrest following the assassination of Martin Luther King in 1968 and again in April of 2015, just because they were close by, they were usually run by immigrants who often don't speak English very well and were eyed by the community with very mixed feelings. The corner liquor, convenience, and carry out stores are seen by residents as a convenience on the one hand, but also as a place that is also poisoning the community with what it needs the least: Alcohol, cigarettes, highly processed meats and often also drugs. When the Mayor stepped into these stores at her recent early morning field tour with department heads she also stepped into a hornets nest with her comments about opening times and the unsanitary conditions she found. The Mayor who doesn't drink, smoke or eat anything processed or fatty certainly remembered many of the talking points her department heads had given her in previous meetings. The health department talking about the 20 years that life expectancy in Druid Heights is lower than in Roland Park, the police department talking about the many calls they get about robberies, drug dealing and loitering at corner stores, the planning department addressing food deserts and its long bruising debates whether to allow corner stores in its new zoning code (in the end they remained legal and became even officially sanctioned while liquor stores were curtailed). She certainly also had heard from residents who complained about the stores as a nuisance. 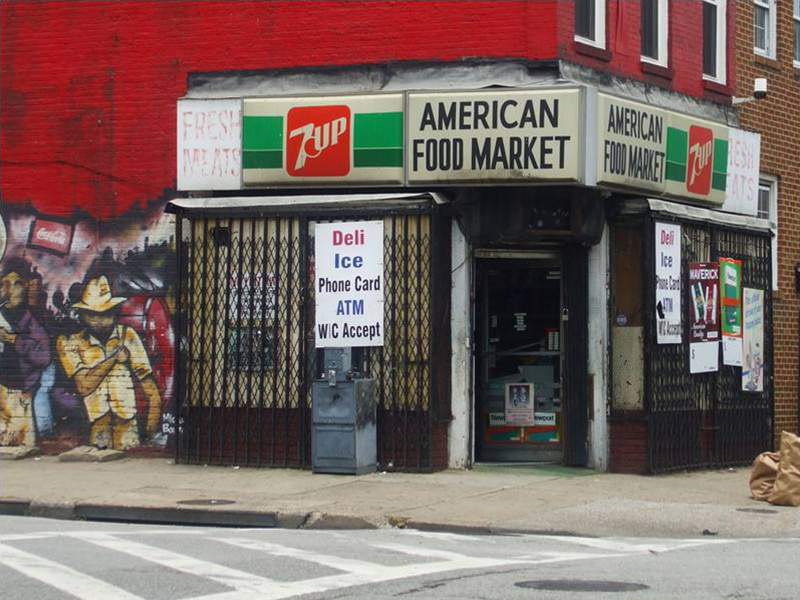 The irony is that corner stores have made a come-back in many come-back neighborhoods. Bakeries, coffee shops, even occasional butcher shops have sprung up in the revitalizing communities of Remington, Hampden and Washington Village. In Pigtown's "main street" on Washington Boulevard Ms Pugh herself ran a consignment store while she was State Senator, celebrating the renaissance of retail there. Of course, most of those corner stores in the disenfranchised neighborhoods in Harlem Park, Sandtown, Park Heights and Rosemont are a far cry from their reincarnated brethren on revitalized "main streets". But are they any less useful? In neighborhoods where more than 30% of buildings are vacant sagging hulls and where up to 75% of households have no access to cars those stores are one of the few places that provide a sign of life. For example, all of the feature ATMs, and a way to get cash in communities that to this day are "redlined" by banks. Shuttering the ones that are not so well run or cause frequent disturbances would certainly not mean that another, better one would magically appear. It would most likely mean that even fewer services are available and another building would stand vacant. 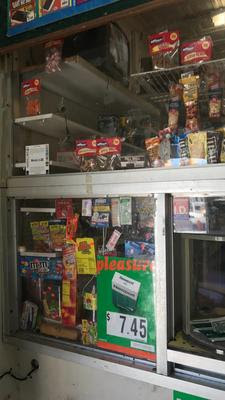 The problem of corner stores, liquor and barbershops which have become part of drug dealing logistics has been discussed many times. So have their unhealthy food offerings and the lack of variety. (They tend to sell the same things, even if there are several in a cluster). There is always some reality in the criticism but the truth is too often layered with innuendo, racism and a sense of superiority that feels wrong and does little to solve the actual problems. The organization of Korean store owners (KARGO) started a scholarship program 23 years ago. with annual grants going to students in neighborhoods where member stores are located. 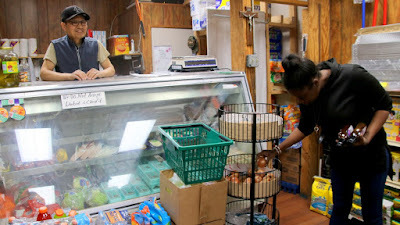 Mayor Rawlings Blake together with Johns Hopkins had begun an initiative of enticing corner stores to sell fresh foods and reduce the problem of food deserts (Baltimarket) although from several defunct weblinks it isn't clear if the program still continues. 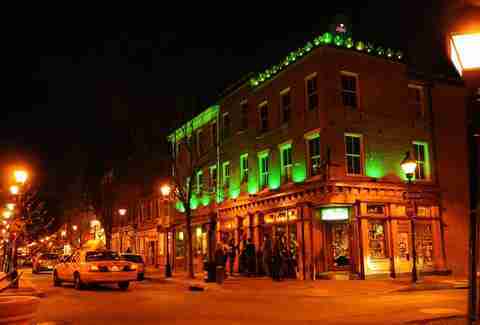 Zoning and the liquor board have addressed the problem of too many liquor stores. My office has received many calls from store owners confronted with issues such as a requirement to create an accessible entrance or to pass a health department inspection of their small commercial kitchen operations. Architectural permit drawings for a store reconfiguration or a use permit, specifications for vent hoods, the complexity of ADA, all these are matters that leave individuals who work those long hours in the stores and are often their own suppliers entirely helpless. If the City really wants to have healthy neighborhoods, better services, healthier food, fewer food deserts and fewer vacant buildings, it takes more than the annual trips to the retail convention in Las Vegas. It takes an intricate, multi-department approach of assistance to small business owners including maybe a "corner store ombudsman" who helps owners to comply with all the rules. The Vacant houses, corner stores and many poor unemployed residents themselves can cause problems. But the solution shouldn't be any longer old style urban renewal tactics of displacement, eminent domain, demolition and forced closure. These heavy handed measures should finally go on the trash heap of history because they just make things worse. What is needed is assistance, targeted investment and building social capital by using existing structures, networks and the entrepreneurial spirit that still exists even in the poorest neighborhood. As one of the gubernatorial candidates put it in a recent debate: "talent is everywhere, but opportunity is not". No, "complete streets" are not mostly about bikes! It is a funny thing how the residents of Roland Park and those of West Baltimore can agree when it comes to beating on bicyclists who occupy valuable street space with their bike-lanes so they can "ride their expensive Italian racing bikes through our streets". The Roland Park residents are incensed by an editorial of Bikemore's CEO Liz Cornish and vent it on the editorial page of the SUN, the West Baltimore residents testified Wednesday against Ryan Dorsey's "Complete Streets" Council bill which finally got its first hearing after having been stalled for about nine months. The thing is, "Complete Streets" is neither a planning tool nor a design principle for just bicycles. It isn't a program to build a lot of new and costly things as an opposing African American resident suspected in her testimony when she claimed that the bill is about expenditure when one should talk about where the taxes come from and what would increase resources. She correctly observed that investments have been made very unevenly and that the neighborhoods where most of the taxpayers live have seen the least of them. Opposing the bill on the grounds of existing inequity is ironic though, because equity is a big part of Dorsey's bill. That the bill won accolades and an award from Smart Growth America may be suspicious to some for the same reasons as the bicyclists, the ""latte sipping millennials" (there is always demographic segment on which derision is heaped, recall the called yuppies?) 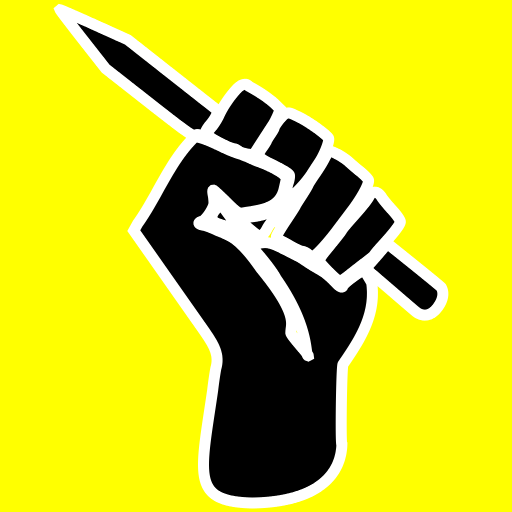 and all those who want Baltimore more attractive to the educated, upwardly mobile and more affluent class until recently dubbed "the creatives". If white activists promote something that the millennials also want, but link the issue to equity, suspicion can grow into anger, even if the matter is approached with the best intentions. "If you are so concerned about safety", a woman testified at the Complete Street bill hearing, "you have to look elsewhere, not bicycling". An obvious reference to the high rate in which young black men get killed on Baltimore's Streets, by guns, not car or bicycle crashes. There are a ton of arguments to be made why city streets to be designed to be more than "sewers for cars" would, indeed, increase equity; but in light of a 20 year discrepancy in life expectancy between Druid Heights and Roland Park, in light of the cities 300 plus homicides a year, in light of the food deserts, and failing inner city schools, Complete Streets seem trivial to many. Not to suggest that the Complete Streets bill would still be in trouble. Ryan Dorsey along with supporters used the last year to iron out many kinks and get the support from the Council President and most heads of city departments, including, reluctantly, from DOT Director Pourciau and the Mayor, with whom Dorsey has frequently been on the war path. That is important, since an eight member coordinating council will consist of the agency heads, a nod to the need for interdisciplinary coordination required to truly make the new equity approach stick. 1000 support letters were counted in Dorsey's office and a slide with the logos of an impressive array of prominent supporting organizations was on display during the hearing. Not only Smart Growth America pays attention to the bill but the national online publication nextcity.org reported about the hearing as well. Public debate about how to design the future of Baltimore is shaped by history more than elsewhere. Understandably so. Yet, being so deeply mired in historic and current injustices should not mean to stand still or not to touch anything until those big injustices are overcome. Attention to the murder rate should not mean that nothing else can get done. Addressing the affordable housing crisis, the persistent problems of vacant houses, failing schools, or the continued problem of getting good services into disinvested communities, should not mean that city agencies can't pay attention how the around 30 square miles of public property which our streets and alleys represent could be made safer and more pleasant than they are. That is especially true in areas where the vast majority of households doesn't own a car and predominantly uses the street to walk, wait for the bus or as an outdoor space while sitting on a stoop to get some fresh air. Well, and yes, to ride a bike. It is a myth that only young white people in spandex outfits and goofy helmets use bicycles. Anyone who ever actually spends some time in the inner city neighborhoods will see kids on bicycles popping wheelies, people running errands on bikes and adults riding on sidewalks or against traffic because there are no safe and convenient ways to get around on a bike. Testimony at the Complete Streets hearing was coming from many sides, old and young, resident and business, individuals and organizations. The vast majority said it is about time that Baltimore makes its streets better so the city can catch up with cities across the country and elsewhere in the world which, in some instances, have been at least since the 1970s on a path to undo some of the damage the undue fixation on the automobile has done to cities around the globe. and yes, it is very inconvenient for those who own a car about to live on a street where the parked cars have to be moved every morning at 7am or every afternoon at 4pm to make room for the onslaught of surbanites coming in or leaving town. So, yes, Complete Streets is also about, gasp!, parking. It is difficult to raise children where the sidewalks are too unsafe for them to be because they are tiny or have no safe crossings. is difficult to be old and frail if the sidewalks are broken up, have holes, no handicapped ramps or are blocked by parked cars, where the pedestrian signal time is only made for those who can sprint, whether one simply uses a cane, a walker or moves around in a wheelchair. Streets without trees get a lot hotter and create a lot more dust than those who have a continuous tree canopy, that is especially hard on those who have no AC or can't afford to run it. many streets are designed for much higher speeds than what the posted limit allows, essentially creating what lawyers call an "attractive nuisance", i.e. something that invites to break the law. Baltimore's unjust past practices should not block residents from a look around the world. Looking beyond our own belly button one can see that the age of the automobile as the sovereign of cities is coming to an end; not because some nefarious shenanigans of a small elite but because cities have become so large and congested that better ways had to be found. Some of these better ways come from technology, but some, like the Complete Streets policy, harp back to the simple insight that putting things closer together works better, that quality matters and that many trips can be made without sitting behind a steering wheel. Simply common sense. Eight years ago when the Baltimore Circulator was new and much shinier than the MTA buses the City fell in love with the free bus. Many still consider it a cool thing even though it's current reputation and appearance is a mere shadow of its former self. What happened? Conceived to be a sustainable and lasting solution it has joined the ranks of other transportation related issues in this city, for which solutions have been kicked down the road leaving uncertainty hovering over them like a sword of Damocles. In the case of the Circulator the biggest culprit is that the system was inflated beyond its means and now seems to run a deficit. Subsequently service and upkeep have been cut in sensitive areas such as head-ways, reliability cleanliness and information. 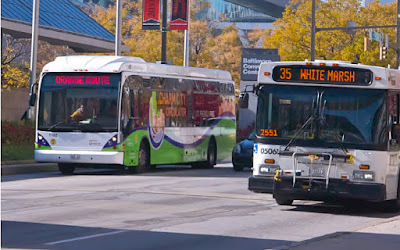 The Governor, in his self-professed quest to improve bus service in this City, has provided a one time cash infusion for the City's system and instructed the MTA to assist in coming up with a sustainable Circulator system that, no small thing for the State, also doesn’t compete with the MTA bus service. 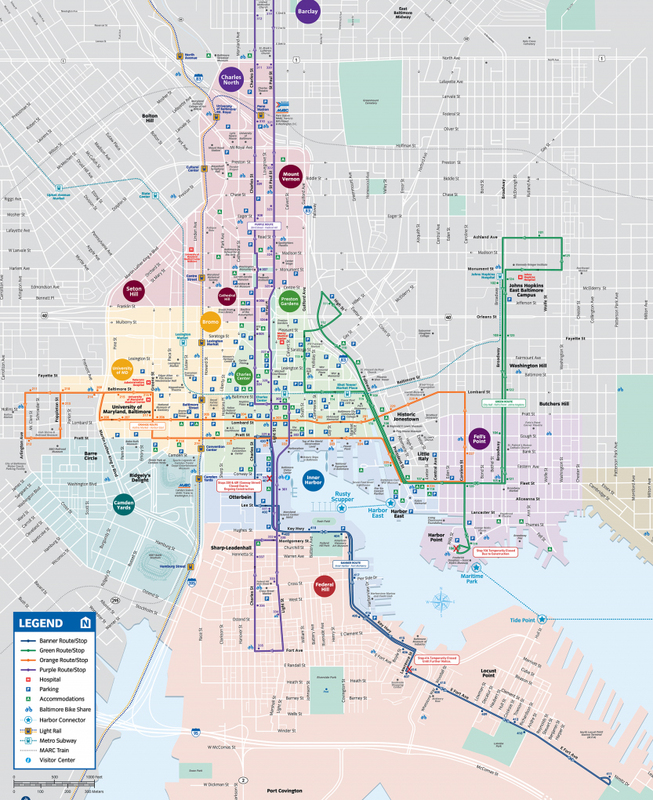 the MTA recommends that the Green route be discontinued entirely. While not as low as on the Banner route, ridership is relatively low on the Green route due to its circuitous routing, and the strongest segment of the route, Broadway, will be served by the frequent CityLink Brown, which will offer a one-seat ride to downtown. As such, the CityLink Brown should provide adequate service on Broadway, permitting the removal of the CCC’s Green route. The MTA also recommends that the Banner route be discontinued entirely. Ridership on this route is relatively light, and should be adequately accommodated on LocalLinks 71 and 94, which will serve the Key Highway and Fort Avenue corridors respectively, offering a one-seat ride to downtown from both. LocalLink 71 is proposed to run every 30 to 45 minutes, and LocalLink 94 is proposed to run every 35 minutes. Meanwhile, Transdev (Veolia) which operates the local transit for the City DOT stated numerous times in the past that their operating cost does not exceed the proceeds dedicated to the Circulator coming from parking fees and private sources. To which the City counters that Veolia's perspective omits the cost of bus amortization, payback of the current fleet and fleet renewal. The buses themselves are a sore topic, because the City had initially insisted on a new environmentally friendly but experimental bus (EcoSaver IV) which did not withstand the rigors of daily operations. Those 13 buses turned out to be a costly disaster vastly increasing the fleet cost because they had to be essentially written off long before a standard bus would be taken out of service. A good six months after DOT had a new director, Veolia indicated when asked that the director had still not met with them. Additionally, a federal grant which was used to pay for the bus route to Fort McHenry had long expired but that route is still limping along with a much curtailed service and a bus every 45 minutes and the existing service contract expired this January. The transportation element of the Pugh transition report would have given some clear guidance and quite concise principles for the Circulator, but they appear to have been forgotten in a drawer as well. All of this can take off the shine on the nicest project and so the Circulator looks like a tired service whose time has come just like so many previous attempts of various parties to run a downtown bus shuttle. 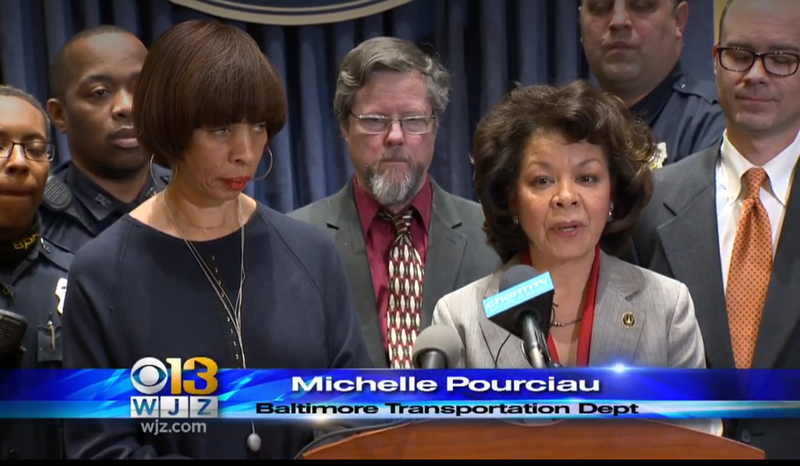 In fact, transit advocate Danielle Sweeney posted on her Facebook page "where is the Bus, Baltimore?" today: "I am starting to think that the city should throw in the towel on this one"
What better time to bid the service out for prospective operators? Well, that is precisely what the City did, forced by the fact that the extended current agreement runs out this October but unfazed by the other fact that the systemic issues remain unresolved. (The Board of Estimates had extended the contract with Veolia Transportation from January to October 2018 for $6.12 million in December 2017 without making any route adjustments). The amended bid date for potential bus operators to return their bids was April 11. A committee currently reviews the responses. About 10 potential operators and bus manufacturers participated in the pre-bid conference but far fewer submitted an actual bid. Which isn't surprising given how the RFP is written. To not be confused about this triangle of MTA, DOT and Veolia (or any other future private operator): MTA is just a bystander who became only a partner by providing a cash injection. Veolia isn't really a partner either, but a company to which the City outsources the operations of buses the City owns because the City DOT doesn't have the capacity or knowledge to run a municipal transit system by themselves. And DOT, well they own a dozen buses and some debt on them. In other words, this isn't and won't be one of those much touted P3s (a public private partnership) because the operator has no equity in the system and has no independence or capability to really reform the system, not now, and not how it is assumed in the RFP. This becomes clear if one reads the many pages of the new two- part RFP which is very clear on where the new operator has to place city logo decals on the buses, but is very foggy on what service is actually expected, the operations being laid out in seven "principles" with very few hard requirements for routes, headways or the equipment except it must be ADA compliant and have automatic vehicle locator equipment (AVL). 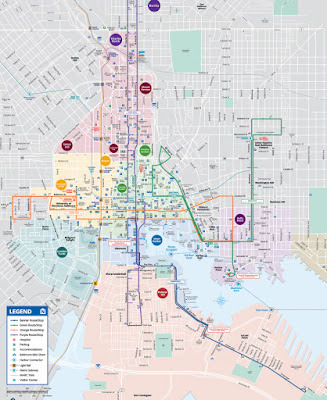 It is the intent of the City to continue the Charm City Circulator fixed route circulator services which are designed individually and collectively to serve a variety of ridership markets, including residents, workers, tourists, etc. in the service area. Routes have been designed and operationally-tested by the City, but will require validation by the Contractor. Offerors may propose minor changes to the routings in their proposal, but shall use the City’s calculation of annual revenue miles and revenue hours for purposes of completing the financial proposal. 75% of the possible 100 points a bidder can score go to price. With this predominance of cost as the deciding factor, one can expect that bidders would either skimp on service (within the soft framework that is provided) or on the equipment (using old, tired buses). Given that the fleet itself had been a major headache in the past, the City asks bidders to provide a cost proposal for three scenarios, all not around different routes but around who owns the buses. (The City has 12 functional model year 2011 Orion buses) which either the city or the contractor would supplement with another 12 new or used buses. (The thought here is of using old MTA buses, a far cry from when the Circulator set out to show the MTA how good a bus service can be!). The third version limits the fleet to the existing dozen buses with a bit more than half the annual "revenue miles", clearly a scenario where the routes would have to be drastically reduced. It isn't immediately clear from the RFP how many buses make up the current fleet (More than a dozen but less than two dozen), what would happen to the Van Hool buses currently in operation or who actually owns those. Not a small challenge for an operator which is expected to run the system by the summer of 2018! The RFP seems to be silent on who will equip and maintain the wayside facilities such as bus stops, the RFP appears to address only signs, brochures and marketing, not shelters, real time bus arrival information, web-based apps or similar rider services needed to run an attractive service. 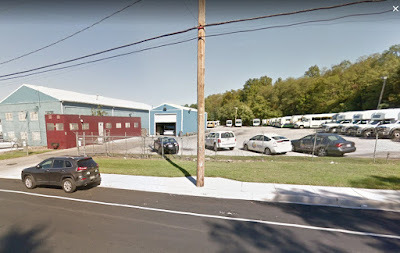 Veolia currently operates a Circulator bus maintenance shop on a 2.3 acre site on Cherry Hill Road which was purchased by a 1400 Cherry Hill LLC in 2000 from the Maxine Tour bus company. Access to this facility seems to be the trump card for a winning bid. Instead of ordaining how many buses to run and asking what it would cost, the RFP would have been more innovative by stating: This is my budget, how much service can you give me for that? In that way the City would have solved its deficit problem plus the bidder who provides the most efficient quality service would have won, not the one with the oldest buses. Synchronized signals - bane or blessing? Synchronized lights were an invention of the 1950s. 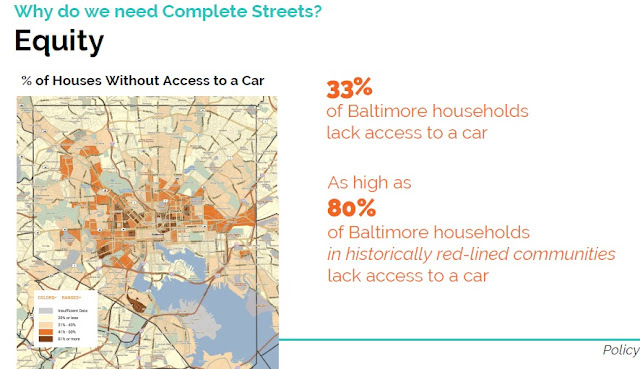 So why can't Baltimore City get it done in the the 21st century? Can't they or don't they want to? The matter is all over the media since Council President Jack Young introduced a resolution yesterday which demands that Baltimore DOT first get their signals synchronized before they start their new initiative "don't block the box" and start fining violators who clog up intersections. 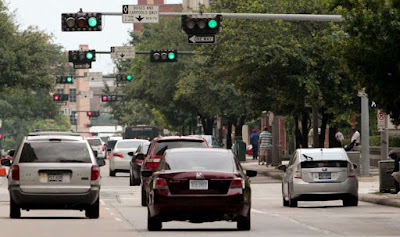 Young has observed that frequently cars get the green light just to be caught at the next signal being red, creating stop and go traffic and drivers who didn't expect to be stopped again so quickly being stuck in intersections. Sounds like a plausible request, doesn't it? Although Young may have taken it a bit far when he requested "that the free-flow of traffic is ensured". In fact, with that demand he brought us right back to Henry Barnes who introduced all the one way streets to Baltimore, chiefly for this one reason: Better flow of cars. Real synchronization of signals is only possible on one way streets, because it means a progression of green lights that rolls along a street at the same rate as the cars move. This dynamic can't work for two way streets, because the two "waves" of green would roll in opposite directions and be in conflict with each other. Barnes, Robert Moses and the whole idea that city streets are only there to move cars as freely as possible have been discredited in our time when we talk about "complete streets", livable and walkable cities and multimodal transportation that gives preference to walking, transit and bicycles over drivers in cars who are eager to leave town as quickly as possible. So how does the synchronization debate fit in? Residents on Calvert and St Paul Streets in Mount Vernon have long complained about how the perfectly timed signals along this pair of one way arteries have turned residential streets into raceways. True, synchronized signals can manage speed only to some extent by forcing the lead cars to go the speed limit to perfectly hit the "green wave". But inside the 20-60 second green phase aggressive drivers can play catch up and speed to get into or beat the rolling green lights, especially when they enter from side streets and floor it to avoid the next signal turning red on them. So there are traffic safety reasons that would make traffic engineers not want to synchronize signals all too well. And then there is technology. As previously explained on this blog, Baltimore's signals and their central controllers are old and the layers of technology that have been added to the originally fairly simple operations of the 1950s have made things worse, not better. Sensors embedded in roadways, which are supposed to influence the signals based on actual traffic volumes, are prone to failure. In many cases there is no good record at DOT where those sensors are, let alone a proper repair log. The coordination of signals requires timers, and implausible as it seems, the reality according to DOT engineers, is such that each signal has an individual timer which, like a real clock, can fall out of sync and cause a slight creep in asynchronicity, requiring DOT staff to reset the timers every so often. Modern computers and camera based sensors would eliminate this problem, but many signals are not on those up-to date systems and one can only imagine how those would be maintained. Finally, there is traffic volume. When there are more cars than a green phase can handle, traffic will back up, no matter what. Especially during rush hour that is often the case. When even four lane roadways without any signals, such as the beltway or the JFX, routinely back up, how would the same not also happen on city streets with signals, merging buses, pedestrians in crosswalks and cars backing into parking spaces? Barnes and Robert Moses saw traffic back-ups as an insult to their profession they had to avoid at all cost. So they built freeways, eliminated streetcars and optimized flow wherever they could, with the result that transit, walking and bicycling plummeted and people with cars moved further out, the faster they could drive, the further . The more traffic was "optimized" the more people needed or wanted to drive, i.e. the more traffic there was. In short, the concept of "free-flowing traffic" is a fools errand. We are not in this mental space any longer. We don't want to promote sprawl but urban living, we want people to be able cross a street safely on foot and we want lively, attractive streets along which one wants to live. No wonder, then, that DOT was not available to respond to Jack Young's resolution on a day in which three people were killed on Baltimore's streets in car crashes. They would not only have to admit that in many cases they are incapable of synchronizing lights in a lasting manner, even if they wanted to do it, they are also held by the same City Council not do it. Still, gridlock due to bad signal timing is in nobody's interest. It blocks cars, pedestrians, bicyclists and buses alike and unnecessarily fouls the air. No matter how bad the traffic is, nobody has to "block the box", a quick glance is sufficient to see if there is space on the other side of the intersection. All eyes on Baltimore - will the city be up to it? 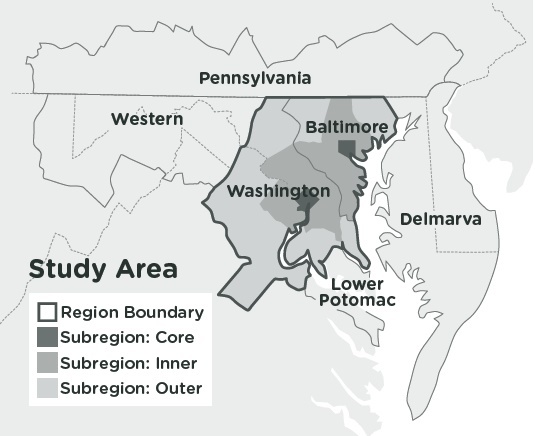 It’s a huge gamble by the largest private employer in Maryland: to drive a huge transformation of the urban landscape, tearing down most of a distressed neighbourhood, relocating about 740 families, and trying to combine a new biotech innovation hub with what it is hoped will be a sustainable mixed-income, mixed-race neighbourhood. It’s a bet on symbiosis – between the university, a manufactured new residential community, and the existing neighbourhoods around it. It’s a bet to revitalise east Baltimore and set a model for anchor institutions in other cities. Above all, it’s a bet that the whole thing won’t turn out to be a cautionary tale. Also making headlines is a brand-new national report from the Brookings Institution titled "Renewing America’s economic promise through older industrial cities". It isn't too surprising that Baltimore would be among the 70 legacy cities Brookings analysed in some detail. 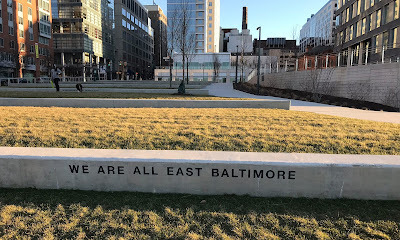 What makes it nice for Baltimore is the fact that the research paper places Baltimore in the top third of its cohort under the category "strong", a fact that the Daily Record immediately reported along with some quotes from Greater Baltimore Committee CEO Donald Fry. But this isn't a cheerleader paper in the spirit of many city promoters but a data based report that sees the problems squarely in the eye and and that challenges the traditional economic development approach. Many share a growing awareness that traditional metrics of job growth and new capital investments are insufficient. Finally, also brand-new, there is the Prospects for Regional Sustainability Tomorrow (PRESTO! 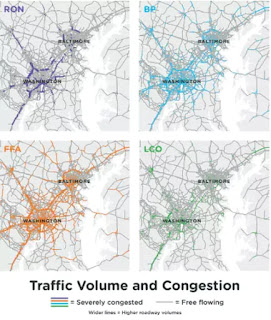 ), a presentation and description of four transportation scenarios for the greater Baltimore Washington region, published last week by Maryland's Center for Smart Growth after a gestation period of 13 years. The modeling is based on four snazzily named scenarios ("Revenge of the Nerds, Free for All Blue Planet, Lasty Call at the Oasis) simulating possible futures for land use and transportation with the help of a complex regional transportation model. 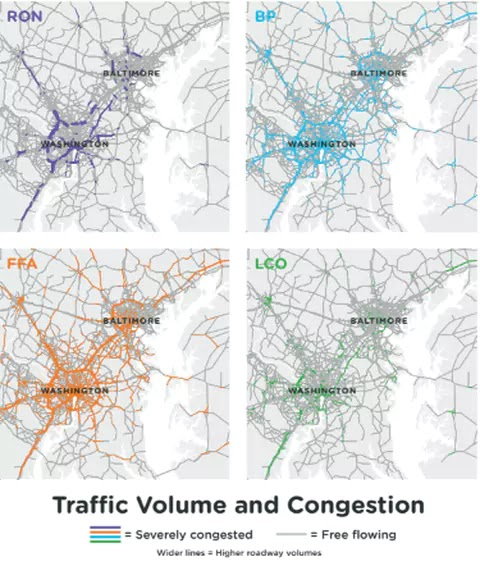 The biggest innovation is that the models look at both Washington DC and Baltimore as a single metro region, something that is as rare as it is obvious. Four scenarios for traffic from "Free for all"
52 percent single-family detached share. New construction will slow as land in the growth areas of the inner counties builds out. The likely result— more development is pushed beyond the state border. Rezoning or redevelopment, if implemented, could also accommodate additional new multifamily housing. None of these three new reports solves Baltimore's problems, has earth-shaking new insights, or absolves the City from pasts sins. Far from it, all three papers, each through a very different lens, illustrate quite clearly that the traditional way how this city and region were governed won't work any longer. In this Baltimore is certainly not alone, as the Brookings report shows, it also isn't the worst case by far. Yes, cities need to work in their region and that requires regional collaboration as both, PRESTO and the Brookings report clearly state. And as transportation models emphasize, this ins't just the region of Baltimore's local Metropolitan Planning Organization (MPO), i.e. Baltimore City with Harford, Carroll, Howard, Anne Arundel and Baltimore Counties, plus Annapolis, but also the DC region which is technically another MPO. 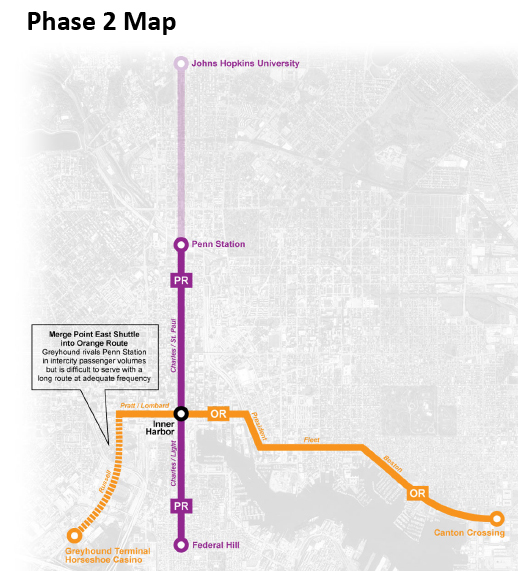 The recently approved State bill for funding WMATA's Metro and MTA gave the region a whiff of this larger picture, something that the lawmakers sponsoring the bill clearly understood. But overall, there is much too little of such collaboration, let alone a real integration of the transportation systems. By limiting access to highquality schools for children of color, residential segregation may contribute to OICs’ significant educational attainment disparities by race and ethnicity. In these counties, only 22 percent of non-white/Hispanic adults have a four-year college degree, versus 38 percent of whites. These aggregates, however, mask particularly striking attainment disparities in highly segregated cities and counties such as Baltimore (36 percentage-point difference), Brooklyn (31 percentage points), St. Louis and Essex County, N.J. (Newark) (30 percentage points), and Fairfield County, Conn. (Bridgeport) (28 percentage points). Moreover, a strong relationship exists between overall educational attainment and OIC economic performance, suggesting that efforts to improve growth and opportunity in these diverse areas must address those disparities. The equity issue is a moral and an economical issue. 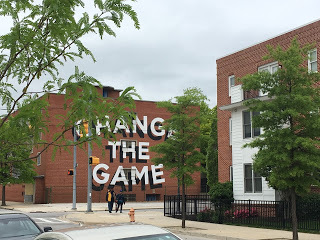 Or as the leaders of Innovation Village West Baltimore, Richard May and Andre Robinson like to say: "You can't win the game if you have only 1/3 of the players on the field". No matter how big the advantages of first tier older industrial cities which the Brookings report lists (great research universities, interesting architecture and a compact urban form, a culture of making, diverse economies), its all for nothing if the inequity in education, in wages and in jobs access isn't improved. The article in the Gardian illustrates how difficult and complicated the seemingly simple equity paradigm can be in practice. Even after the great research university of Johns Hopkins invested in a neighborhood which hadn't seen real investment in decades, this alone didn't create equity even though it responds to the demand to invest in neighborhoods. It especially didn't create equity since the existing vulnerable populations had been displaced, even if this responded to the consent decree of avoiding concentrations of poverty. EBDI is being accused of raising inequity even though the displaced residents received relocation fees that far exceed the depressed values of their old homes and bought them homes in areas with much better opportunity and even though residents were offered to return to Middle East, after new homes were constructed. As the Guardian reporter duly notes, the EBDI plans smack of old style urban renewal, even though a lot of people engaged from the onset to avoid just that and to ensure that existing residents and communities would be protected and affordability be baked into any deal from the onset. The Guardian also looks at the Oliver community to the west of EBDI and an approach there that brings investment without displacement. Critics will still question whether renters are truly protected, because they usually don't participate in whatever value creation there is in any community. The EBDI article in the Guardian describes the conundrum between conserving the status quo (often terribly unsafe, unhealthy communities with poor services and a very low quality of life) and investments which makes things better but raise costs. The EBDI debate ensues even where the early drastic approach of a blank slate with wholesale demolition and displacement of thousands is carefully avoided. The conundrum is very real. Under the banner of gentrification, a word that is always meant as something bad, the debate leaves little room for discussing the benefits of value creation especially in communities where minority homeowners have been cheated out of the American dream of using a home as security and as an investment in one's own future due to redlining, racists ordinances and zoning and the entire slate of open or covert tools that resulted in keeping black people poor, less educated and without good access to services and opportunities. There can be no equity unless the artificially depressed property values increase for black property owners as well, allowing home equity to be accrued so loans can be made and buildings can keep up with the times. Yet, no legacy city has yet found the magic pill on how to let appreciation happen and avoid displacement, whether it is homeowners who can't pay their taxes any longer (in spite of the 4% homesteading cap on annual tax increase), homeowners who can't resist the lure of selling to fund other urgent needs or renters who can't afford the higher rents. The Brookings authors realize that help for the older industrial cities which they investigated won't come from Washington any time soon. Instead, it will take extraordinary local leadership not only in City Hall but also in the region, in institutions and in the private sector to turn the ship. In general, the nation’s 70 older industrial cities possess the assets that matter in a modern, global economy—innovation capabilities and research universities, considerable STEM talent among a diversifying workforce, and a commitment to quality neighborhoods and employment centers. While federal policies could better strengthen these regional assets to promote growth in the industrial Heartland, such reforms are not likely to happen anytime soon. Instead, it will require local, regional, and state leaders to step up and together reposition their economies for growth and inclusion in an era of rapid global, digital, and demographic change. Older industrial cities such as Baltimore have, indeed, a unique chance to show that community investment, development, chnage and equity can go hand in hand. A new day for safety on Baltimore's streets? As Michelle Pourciau, Baltimore's Director of Transportation likes to say, she manages the largest piece of real estate in all of Baltimore City. That is true, Baltimore's Streets and public right of ways may constitute up to 30% of the city land area, that would be 30 square miles of land! This week Pourciau got prime time TV coverage to talk about her streets on all major local channels by announcing to ticket those who block intersections. Unfortunately, a lot is not well on her real estate. In large part designed by an infamously car-centric traffic czar of the 1950s, Henry Barnes, it isn't a great exaggeration to say that the streets of Baltimore have become a truly mean place in which it is too easy to get killed or maimed, not only by gunslingers but by speeding drivers who pretty much ignore all the rules without fear of any repercussion. 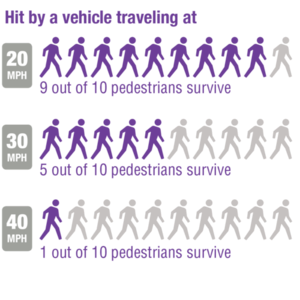 Each year, nearly 20,000 crashes occur on city streets, including 30 percent of all statewide pedestrian crashes and 17 percent of all traffic-related pedestrian injuries. 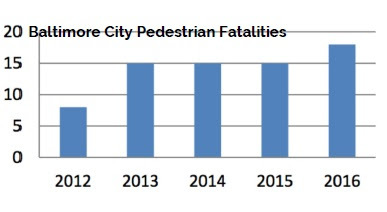 513 pedestrians were hit by cars in Baltimore City in 2016, 20 fatally. 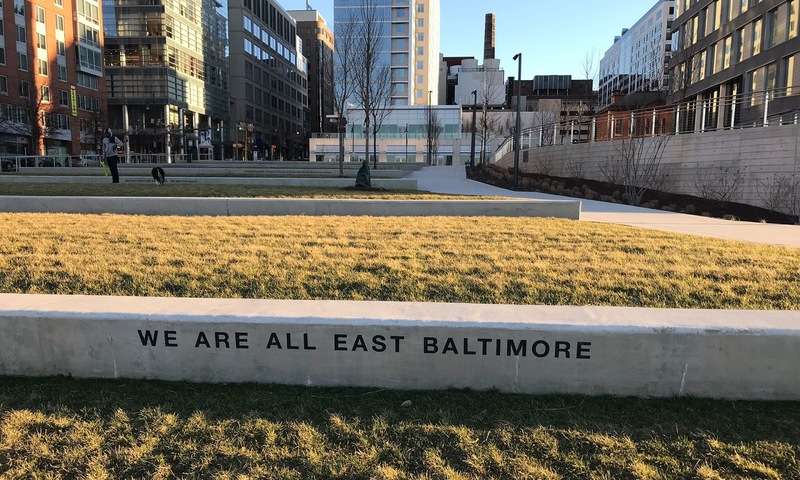 "Leading the State", the Mayor said, certainly not an area where one wants to be in the lead, even though Baltimore continues to be the largest city in the state. The City announced action package to do something about safety is good news. (Department of Transportation Launches Comprehensive Safety Campaign Aimed at Reducing Accidents on City Streets). However, the package is rich on slogans (“Don’t Block the Box”, "Don't be that person") and meager on facts, metrics or benchmarks. 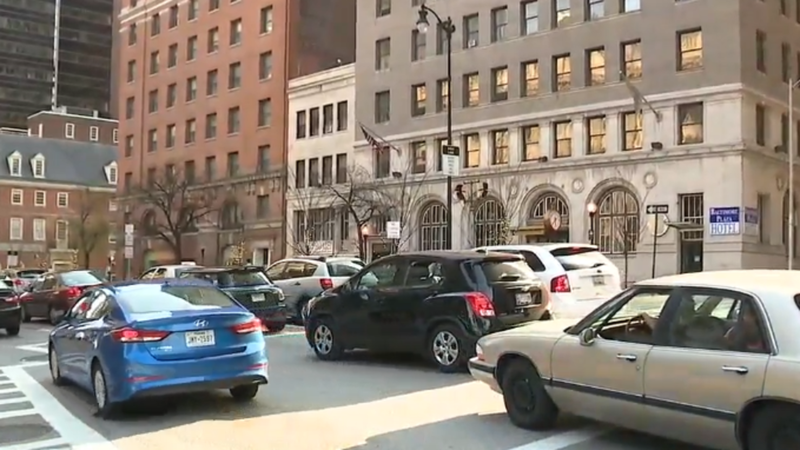 The media attention was given to the announcement that the City will enforce "blocking the box" with $90 fines and a point for a moving vehicle violation. Blocking intersections is certainly a big nuisance and fining violators worthwhile, it is hardly a logical outflow of a careful analysis of the biggest hazards on Baltimore's Streets. Rawlings Blake's safety plan of 2015: Forgotten? The Department of Transportation should quickly analyze the top 10 high-crash locations (intersections and segments) to identify and implement low-cost improvements such as advanced hazard identification warning devices/ dilemma zone guidance, signal re-timing, turn restrictions, additional and upgraded traffic controls (signals, signing, and markings) to immediately improve safety. Conduct “before” and “after” studies to determine the effectiveness of the improvements. Establish and train a multi-discipline team of planners, engineers, maintenance personnel, law enforcement, and safety professionals to conduct up to six corridor audits per year to carefully review crash data, field investigate roadway conditions, report on potential road safety issues and identify opportunities for improvements in safety for all road users. It isn't clear if any of the many actions in the plan were actually undertaken and if the annual data collection has improved since 2015. The announcement this Wednesday made no reference to the 2015 action plan and provided no indication whether crash statistics have been improving or worsening, no baseline data and no targets. (Unfortunately crashes and fatalities have been going up recently in national, state and local data). Similarly, the revival of traffic enforcement cameras for speed in school zones and red light running was also not based on specific crash data or set in relation to the 2015 plan. The SRB plan was strong on improving the data base and mapping of crashes. A search on the DOT website with the keyword "crash statistics" yields as the only result the newly announced safety initiative. One can't know if the new Transportation Director read the 2015 plan at all, what she thought of those goals and what her Department has been doing since 2015. From a citizen perspective it is disconcerting if each successive head of DOT starts from scratch instead of building on what was done before. Even more troubling would be if the department sat on its hands since 2015. The new emphasis on enforcement and fines is also not all that comforting, especially in the case of the "block the box initiative", since it wasn't announced from where the capacity to monitor the infractions would come. The whistling DOT traffic officers in their lime vests have no enforcement power and cannot write tickets, especially not those that carry points. So it would take Baltimore Police to do it; we know they are busy elsewhere. Talking about police: Just as crime can't be eradicated through policing alone, frequent and blatant traffic violations can't be eliminated by enforcement alone either. In both instances one has to address the root causes of the problem. In the case of Pourciau's real estate, Baltimore's streets, it is all too often the design that contributes to those streets being so hazardous to pedestrians and bicyclists and even to the car drivers themselves. 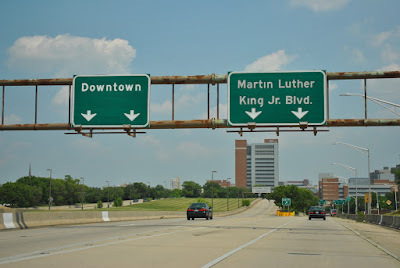 "The Highway to Nowhere", for example, invites people to be used as a 1 mile drag-race course, designed for speeds like an Interstate, people routinely press the pedal to the metal and easily reach 70 miles an hour in the middle of the City. The three available lanes allow the rogue drivers to weave around slower traffic. No reason in the world why this useless stretch of freeway could not be seriously reduced in width for a tamed flow of traffic appropriate for downtown. The extra space could be added for a wider green median. Martin Luther King Boulevard, Druid Hill's Lake Park Drive, Key Highway, sections of North Avenue, Northern Parkway and many other arterials are also too wide and designed for speeds that are higher than the posted speed limit. It is precisely this issue of design which must match the desired (posted) speed limit that is a core topic of Councilman Dorsey's Complete Streets legislation which, if implemented, would go a long way to make City streets safer. The bill is finally moving in the legislative process after it had reportedly been stalled by DOT for nine months. There wasn't a mention of the bill at Wednesday's safety campaign announcement. For true safety to be achieved on Baltimore's streets, it won't be enough to have flashy campaigns. Instead it takes a systematic analytical approach based on real data. It takes realistic goals and systematic measures of progress. And it takes collaboration between DOT, City Council, MTA, police and those agencies that want to foster economic development. 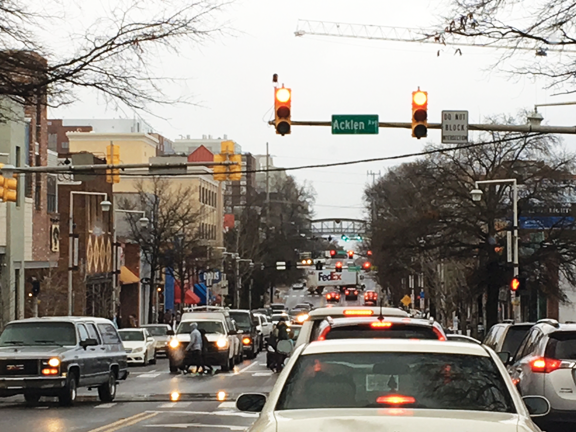 Street safety is better where streets are not just "traffic sewers" but are vibrant main streets with open businesses, busy sidewalks, curbside parking, bike lanes and safe crosswalks. These are matters of design first and enforcement second. Vibrant streets are not only safer in terms of traffic but also safer in terms of crime. What could be a better investment for that publicly owned real estate? Baltimore's parks, gardens and food farms have been discussed in the context of food deserts, equity, social determinants of health, Vacants to Value (V2V), stormwater management, resilience and workforce development. Last Friday the national organization Project for Public Spaces (PPS) added its voice reporting about yet another purpose: Urban gardens as a place for immigrants and refugees. The Office of Sustainability inside Baltimore's Department of Planning, can put up a good show and get an excellent response as became quite obvious at last week's Sustainability Open House Baltimore. The large exhibit space at the lower level of the War Memorial was teaming with activity and the wide array of displays clarified how green spaces relate to all those topics. 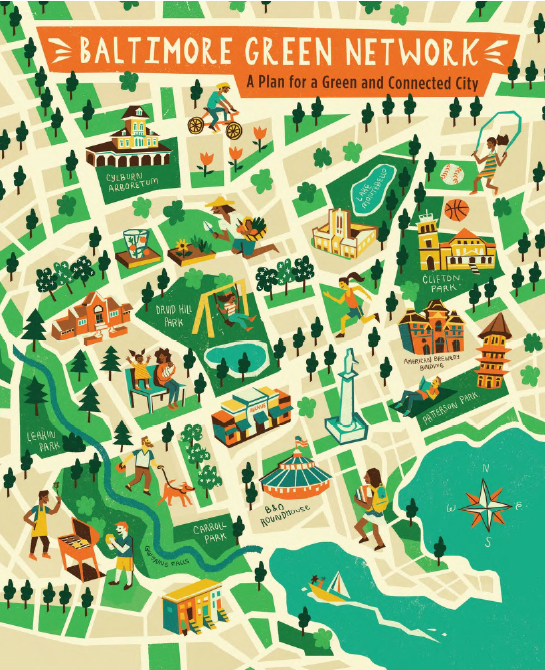 The Baltimore Sustainability Plan is up for comment here. 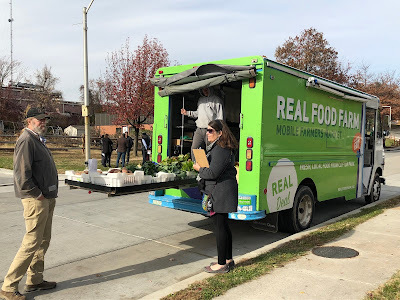 Baltimore has a robust culture of urban gardens, urban farms and CSAs which government agencies such as the Office of Sustainability, non-profits such as Baltimore Green Space or Hunanim (City Seeds and School of Food) have cultivated for years. Some of the harvest has been part of Baltimore student's cafeteria food for years. Some is coming together in advanced operations such as the Baltimore Food Hub which opened last year in East Baltimore. 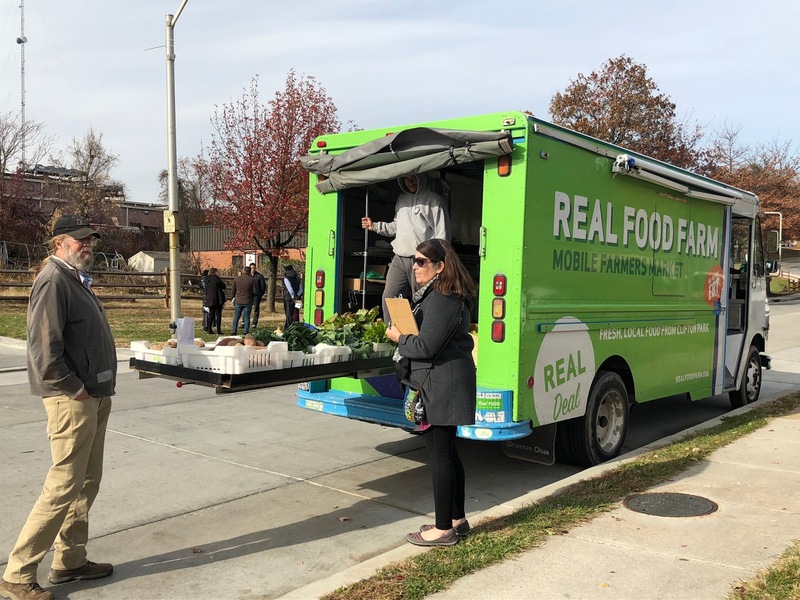 The activities have made Baltimore a go-to place for connecting schools, education, equity and urban food production. The Planning Department is hoping to open a new green chapter with the new Green Network Plan which has been in the works for several years and is now out for final comment. A single plan is trying to tie all green spaces together with a special emphasis on under-served communities. The Baltimore Green Network plan's vision promotes urban resiliency through land use equity. The plan seeks to transform vacant properties into green community assets - and to connect these spaces to schools, homes, retail districts and other activity centers. At the root of the plan lies the insight that green islands won't do much if one can't get there or if they are not connected. Or as Ryan Dorsey likes to say about inaccessible assets: “If you can’t get there the opportunity might as well not exist”. 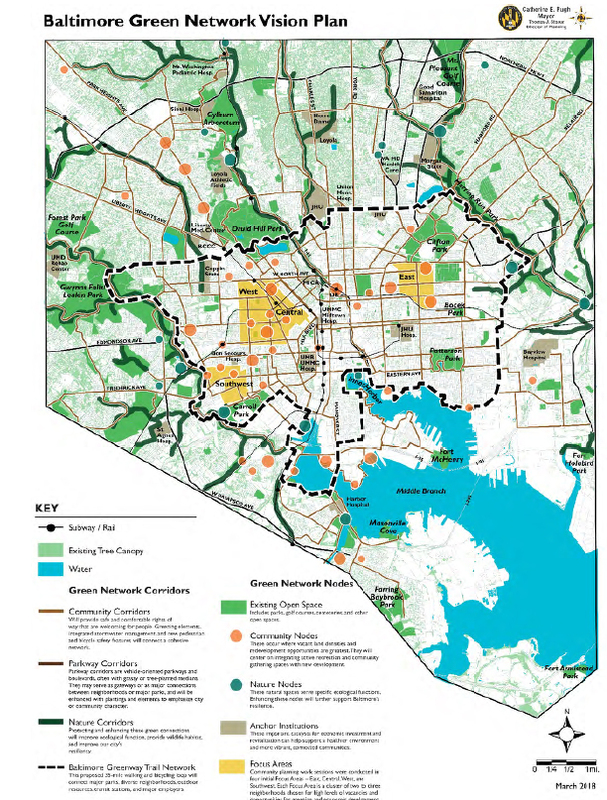 The Baltimore Green Network Plan (BGN), therefore, consists of nodes and corridors whereby some of those nodes and corridors already exist and some would need to be created to create a network. In many respects the draft plan is reminiscent of Baltimore's 2015 bike masterplan which included everything that an ideal bike city would offer but didn't offer an implementable plan with priorities and a clear strategy how one could achieve the end plan. Something the Mayor's Bicycle Advisory Committee achieved with its 2017 plan update. Similarly, the BGN needs that kind of simplification to be actionable plan. In addition to the crops the refugees were planting, Baltimore’s gardens began to nurture a sense of social cohesion among residents. In the fall of 2017, PPS joined the International Rescue Committee (IRC) staff in Baltimore to help the New Roots gardens reach beyond their initial purpose, and combat social separation in refugee communities. PPS and IRC staff, along with several community partners and stakeholders evaluated the urban gardens and discussed whether they were bringing long-time locals and refugees together. More than a space just for refugees, the gardens would be even more valuable as spaces designed to attract everyone; bringing about the small daily interactions that break down barriers between people. Now, the New Roots program is part of “a grassroots approach, helping people to see across difference,” through the lens of agriculture. This is precisely what Baltimore needs, places where people can see across their differences. If the new bike and trail network plan (including the Rails to Trails loop), the Green Network and PPS' work with refugees get connected the right way. a lot could be gained. Don't forget to leave your BGN comments here. 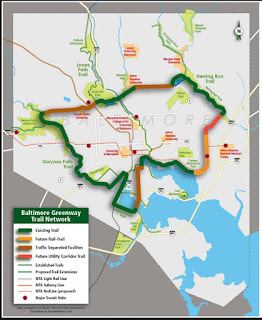 Rails to trails loop plan: Simplicity! Urban Farming - A passing Fashion or a viable Solution? Green network or backdoor for demolition? What better time to think about light than the week of Light City Baltimore? Like much that is taken for granted, upon further inspection, the matter of light is complex whether one looks at it as a basic urban amenity in the streets, or as an accessory to highlight or brand buildings or as a tool of interior design for homes. Much is counter-intuitive, for example that one may see better with less light or that the brighter and whiter lamps of the latest generation use less energy than their dimmer but warmer predecessors. Light is frequently still considered a sign of affluence, certainly of consumerism (Times Square is ground zero for both) but in reality better off neighborhoods tend to be dimmer than those suspected of high crime. Few think of light in terms of equity, and those who do consider the number of broken street lights or the brightness in the street, not the quality of light and how comfortable and inviting it makes a neighborhood at night. Simplistic thinking postulates that crime thrives in darkness and that bright lights are therefore a solution to combat it. Baltimore, deep in the trenches of crime fighting, has long deployed light as a weapon against crime and has flooded crime hot spots with mobile lights bathing whole blocks as if they were movie sets or as if the block had been pulled over and the squad car was now blasting all available lights. The mayor has determined that certain streets in disinvested communities were too dark and campaigned on thousands additional street lights equipped with bright LED instead of the yellow high pressure sodium "cobra head" street lights that were common for at least 50 years. It has never been easier, cheaper and more enticing to install bright lights. Like with all new technology, there is a tendency to overdo it. Just as wider streets are not necessarily safer, nor a brighter streets. 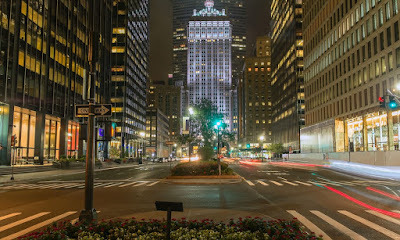 Unintended consequences lurk at every junction: Is it really progress to make the vulnerable neighborhoods as bright as an operating room while the posher neighborhoods savor their darkness with cozy gas lantern replicas? Is it progress when people can't sleep in their street facing bedrooms because misdirected bluish white light messes with their circadian cycle? 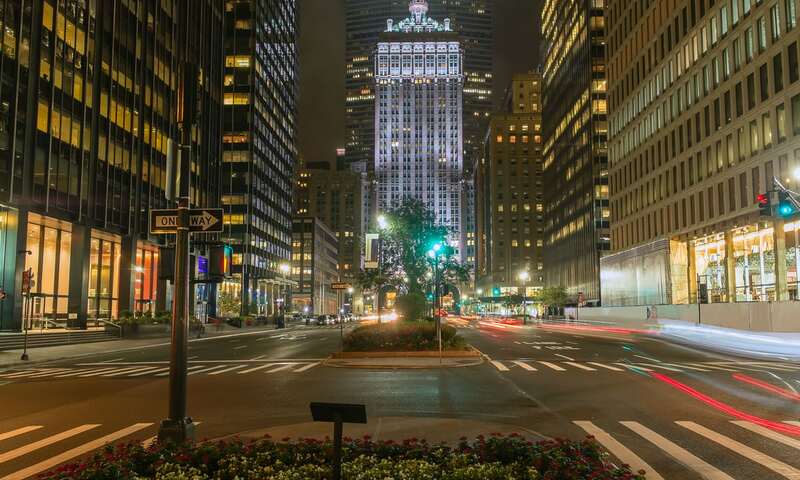 The more technology advances, the more complicated becomes the task of lighting a street, a plaza, a building or a room because of all the choices. Smart lights are programmed to adjust to ambient light and conditions or to how much light is needed depending on activity levels. One of the beaties of natural light (daylight) is its natural variation even in areas where there is hardly a cloud. Morning light is different than light at noon or at sunset. Clouds, of course modify light even further. So far electric light is nowhere near to produce such variation or range of "moods". Since lighting can be so much more than it used to be, it is time to consider light as an important design tool and not only as a basic matter of functionality with a binary setting of on and off. Nor is more lighting always better lighting. As anybody flying over the east coast on a clear night can attest, lights have become so bright that it is no problem at all to see them from six miles up. Too much light can be blinding, can make a place feel uncomfortable, can mess with the sleep of people and animals, can distract birds and block the view of the universe. The beauty of a starry night with millions of stars visible with the naked eye has become the privilege of ever fewer people simply because over illuminated gas stations cast their glare for miles. Different people have amazingly different views of what light makes them feel comfortable. While most people used to having electricity around prefer warmer tones, folks in developing countries where electricity is still novel prefer bright fluorescents. Many Baltimoreans miss the warmer glow of the holiday decorations at the Washington Monument after they were replaced by bright LEDs which can change their colors, but limited to early LED technology, remain in the "cold" range of colors. The correlation between crime and light is tenuous, correlation doesn't prove causation. Bad lighting can have the opposite effect if it creates glare. Everybody knows the movie cliche when the bright light is directed at the defendant in an interrogation. Savy negotiators know not to place themselves facing the window because they can't see their counterpart's face. Just as too much light can blind, less light can enhance night vision, a somewhat counter-intuitive effect. The natural ability of humans to see in the dark through the gradual dilation of the pupils is blocked by bright light sources, even if they are in the periphery of the field of vision. Bad basket ball court lighting or poorly positioned lights on ski slopes can make exercising the respective sport nearly impossible. Car headlights have become brighter and brighter over time, a vicious cycle, because those blinding lights of oncoming cars require your own headlights to be bright as day for you to see once the oncoming car has passed. Far beyond those practical matters, because light can also change emotion and well being it is worh exploring the direct but puzzling relation between emotion, light and the eye's pupil. Even though the scientific correlation between emotion and light remains largely unknown, retailers have long used light to make their stores look "just right". The discounters bright fluorescent ceiling lights are replaced by properly installed specialty lighting in more expensive stores which make the goods look attractive and give the consumer the sense that the goods (and by extensions, they the customers) are precious. Even though people generally yearn for the brighter days after long winter nights, and even though humans have a long history of expelling darkness through light, illumination needs to be much more than making the night an extension of the day. Nature doesn't work that way and neither do humans. Architects, lighting designers and the consumers themselves need to take some advice from the book: Dark Matters, a Manifesto for the Nocturnal City. So before unplugging all those dimmer lights in the streets and homes and unscrewing every bulb in every room to be replaced with light emitting diodes (LED), its worth considering truly desirable outcomes to avoid the bad results of thoughtless lighting. As for safety in neighborhoods, it should be less about brightness and more about community pride and identification. The best contribution to safety comes from residents who identify with their community. A committee of Senator Shirley Nathan Pulliam's Social Determinants of Health Task Force which is now officially legislated through bill SB 444 is looking to improve health in vulnerable communities through lighting. This seemed really far fetched even to the committee members themselves until they looked at an initiative of the Robert Wood Johnson Foundation tested in Washington State in which not the street lights but the private ones at the front doors of houses were the target. With a few funds neighbors were enabled to fix broken bulbs and lights to brighten up the side-walks leading to a marked uptick on how residents rated their own security and community. 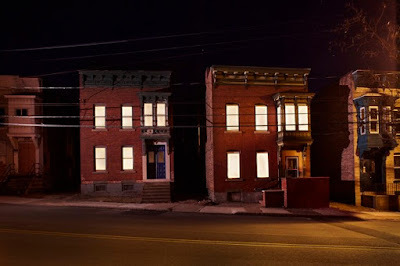 In that program those individual front lights would still be missing on vacant buildings, though, a major problem for Baltimore. The dark hulls of those vacants depress the minds (and health) of their neighbors in many ways, lighting or the lack of it is only one concern. But there is a model program for this problem as well. An artists' campaign of putting lights into the windows of vacant buildings in upstate New York not only shed a light on the problem of abandonment but also let the affected neighborhoods shine in a new light. 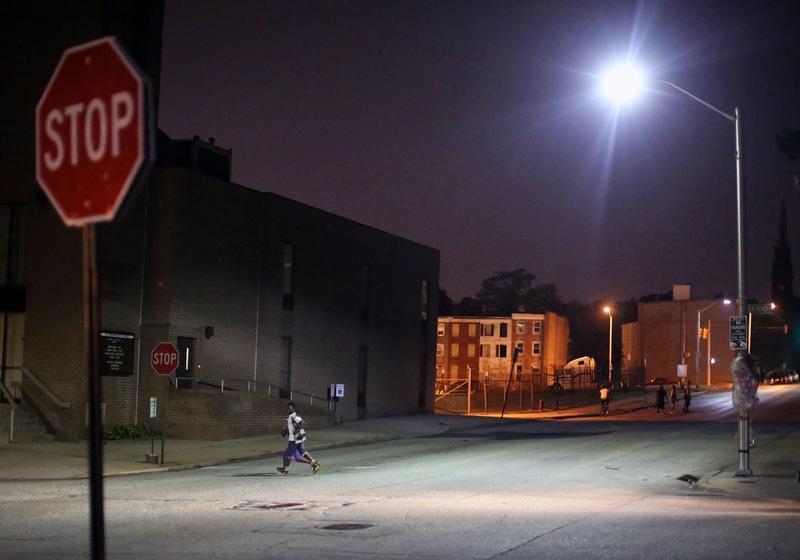 Even though temporary, through feeling valued, it did a lot more for the residents than those mobile lights Baltimore employs for crime prevention. Or as the Robert Wood Johnson Foundation discovered, by donating money to give people the resources to install front door lights: To heal a community, build capacity. As for creative ways of using light as a way to make better places, Light City Baltimore can provide ideas. What are the light innovations in Baltimore? Celebrating light in dark times - "Light City Baltimore"